This weekend one of my friends stationed in 宇都宮 Utsunomiya had heard of an obscure festival in some very northern part of 栃木県 Tochigi Prefecutre called 那須 Nasu (which curiously enough also means eggplant in Japanese). But it gets weirder. On this mountain is a stone called "the murder stone" which is said to have killed countless critters over the time. 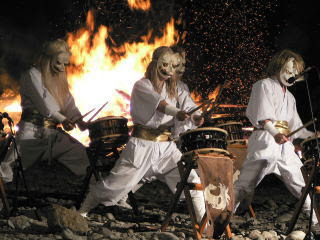 It is usually not strong enough to kill humans yet... And to keep it that way the locals of 那須 Nasu make an annual festival where they dress like mystical fox creatures do ecstatic dancing and drumming on 太鼓 Taiko (a big Japanese drum), while holding torches and burning big piles of wood. To be able to understand the myth this festival is based on, we first have to learn about foxes. As in Europe foxes are said to be very cunning creatures in Asia, yet unlike in Europe in Asia there are mystical foxes that can develop in power growing more tails (up to 9) which eventually reach the level where they can shape shift and imitate humans. Foxes are said to be tricksters and like to play with humans, which is while there were usually feared. If you track back legends about foxes you will also find really old ones in India and China. 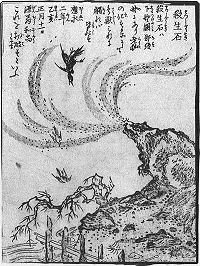 For a time people thought Japan's tales about mystical foxes were therefore just an Indian or Chinese adaptation, but some stories have survived were foxes have benevolent attributes and fight with and for rather than against humans. So it can be believed that Japan had its own legendary foxes when and wherefore it openly accepted additional tales from Asia. These Ninko were very fond of taking possession of beautiful women, which is why those women were sometimes feared. In the Mid Ages it was believed that if you encounter a woman alone on the street at night, she is just bound to be a fox (either possessed by or a shape shifting fox itself). "Confound you!" snapped the fox. "Give me back my ball!" The man ignored its pleas till finally it said tearfully, "All right, you've got the ball, but you don't know how to keep it. It won't be any good to you. For me, it's a terrible loss. I tell you, if you don't give it back, I'll be your enemy forever. If you do give it back though, I'll stick to you like a protector god." 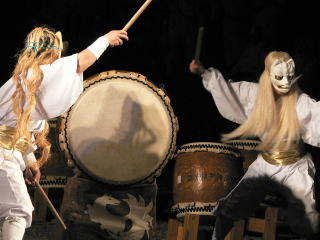 Now that you know about Kizune, I can tell you the legend, the festival in Nasu is based on. Once in Japan there was said to have lived an extraordinary beautiful woman, whose looks were only surpassed by her incredible wisdom and intelligence. She was the most beautiful and clever woman in the whole country, and as such it is not surprising that emperor Konoe heard of her. After he met with her only once he fell into deep love with her and decided to make her his empress. After some time Emperor Konoe fell deeply ill and no doctor could tell him what was wrong with him. 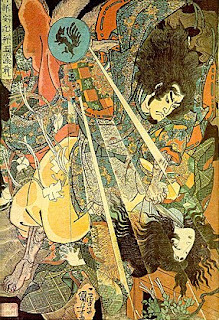 So he took counsel from his astrologer Abe no Yasuchika, who found the source of the sickness in his wife Tamamo no Mae, who he uncovered as a shape shifting fox with the devilish plot to make the emperor ill and take the throne for herself. After hearing that the emperor was outraged and called for the best warriors and hunters of Japan to hunt down the fox. But Tamamo no Mae was able to elude their hunters for quite some time, until eventually she got cornered. At this time she revealed herself in the dream of one of the hunters Miura no Suke and begged for her life. 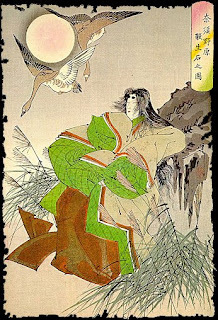 Mirua no Suke refused and the next day he struck the fox with one arrow in the plain of Nasu. When Tamamo no Mae's body was struck she transformed her body into a stone using her last magical powers. 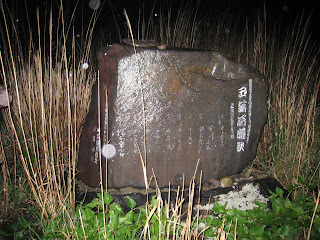 The stone was henceforth called the killing stone (殺生石 Sesshoseki) and killed everything that came into contact with it. While her body became the stone, her spirit haunted the stone henceforth. 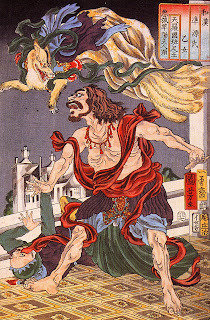 Up to one day, when a Buddhist priest choose the stone by chance for a rest and was attacked by her spirit. He performed certain spiritual rituals and eventually succeeded in convincing the spirit to search for salvation and to never haunt the stone again. So the villagers meet once a year at this very stone to repeat rituals similar to that of the monk, to keep Tomamo no Mae's spirit away from the murderous stone. This rituals include building a huge pillar of wood, which will be inflamed at night. 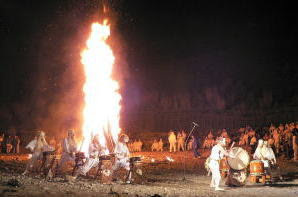 A lot of 太鼓 Taki drumming and wild dancing carrying torches in the hands. 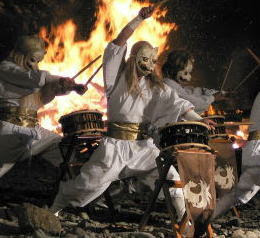 Also participants (anyone can participate) wear fox masks and costumes while performing the rituals. However this year Tomamo no Mae found a way to avoid this festival/ritual and return back to the stone: Heavy Rain. Since the festival's foundation is fire, it cannot take place when there is heavy rain outside. 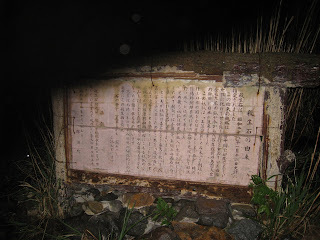 As misfortune or Tomamo no Mae's magical powers wanted it, heavy rain started just when we arrived at the site of the 殺生石 murder stone. We had but one token of light, which was a kind of wooden hut next to the stone, it had huge openings in all four directions, yet it would at least shield us from the heavy rain. 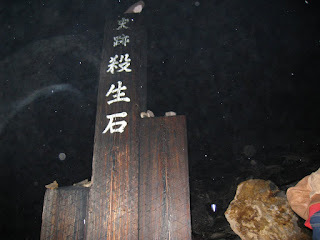 Since we could not return anymore, we decided to make the best out of it and at least visit the legendary stone. And as it is in Horror stories we decided to challenge the legend and touch the stone. Remember the legend says, whatever touches the stone will die. So we made a pledge that whoever of us would die first would be given a funeral by the others, who then would try and challenge the curse. So ignoring all warnings from the legend, we touched the stone. We felt a little awkward but nothing happened, so we returned to our shelter and prepared for the night. Using a rope (always carry a rope with you!) and a flashlight, I built ourselves a twilight lamp, filling the room with just enough light to eat the stuff we brought, drink some wine and tell each other horror stories. Meanwhile the rain was getting heavier and louder and because of that a really tight mist clad the whole area. When I left the shelter for some human necessities carrying an umbrella I could see no more far then a couple of feet, the rest being hidden in mist. I challenged myself in trying to find the murder stone in this mist and slowly step by step approached where I thought it to be. At first I got really scared, because I could not find it anymore, but then it appeared and seemed to mock me "So there are no rituals today, because of a bit of rain. You know what that means, especially after you touched me!". I hurried back into our shelter and hid myself in my sleeping bag. Now apart from the heavy rain a really strong wind was coming up blowing the rain partly into our shelter. This was when we stood up and screamed "That's it! The Stone is trying to get us. We need to fortify out position and build palisades!". We looked around and found a huge pile of folding chairs prepared for the canceled festival. We stopped seeing chairs and saw palisade material and started putting the chairs on top of each other slowly erecting palisades around our shelter. Having found the chairs we looked what else was stored in this hut and found two more tables and a red carpet. We used the additional tables to create a five person bed in the center of the room and used duct tape to a fix the carpet on the table. Like this we would be able to sleep close together and give the stone less possibilities to take one of us alone. Outside of the hut, we could see the dark grey shapes of two Buddha statues. Whenever someone looked at them, however, they seemed to face into a different position. Usually Buddha statues are meant to protect people, but since they are made of stone, and the murder stone was so close nearby, Tamamo No Mae was probably able to control them. Still as long as they only turned, but did not move we were save. Also how could they penetrate our fortifications? So we managed to get some sleep, often waking up and checking the environment. And thus we barely managed to survive. In the morning the people from yesterday came back, surprised to see us still alive (maybe their surprise was due to the palisades we erected, I cannot tell). They told us, they will perform another ritual this day without fire, yet trying to calm Tamamo no Mae's spirit. We removed our palisades and cleaned our fortress. The red carpet was later used as their ceremonial carpet, where they put sacrifices to the fox goddess Inari on. I hope we did not defile them by sleeping on it. To wake up and get rid of the fear, we decided to walk the nice hiking path nearby the stone, encircling it by climbing up and down the mountain. 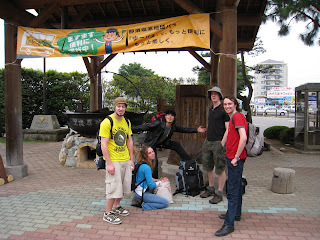 Then we refreshed ourselves with some Soba and started the long journey back to our homes. If you have any information about Tamamo No Mae's curse or about how you can survive the touching of the murder stone, please forward them to me. You forgot to mention though how we heroically tried to kill ourselves climbing up to the peak just after touching the stone. Also, how our palisades held off the festival guys for maybe a minute or so, without even being manned! thx Viktor for your additions. Yes our folding chair palisades were almost impenetrable!